The Mediterranean diet has consistently been lauded as one of the healthiest diets, with a long list of proven health benefits and a reputation for being an enjoyable eating plan to adopt. If you're looking to get on board with the regimen that so many have found success with, you can study up on the background, basics, and benefits here—as well as a handful of Mediterranean diet meal plans drawn up by experts in the field. We reached out to two registered dietitians, a heart surgeon, a certified culinary nutritionist, a nutrition and cognition physician, and an Italian-born chef (because flavor) to share their expertise on the subject and craft five Mediterranean diet meal plans. Keep scrolling to see what the experts have to say, and find their Mediterranean diet meal plans below. 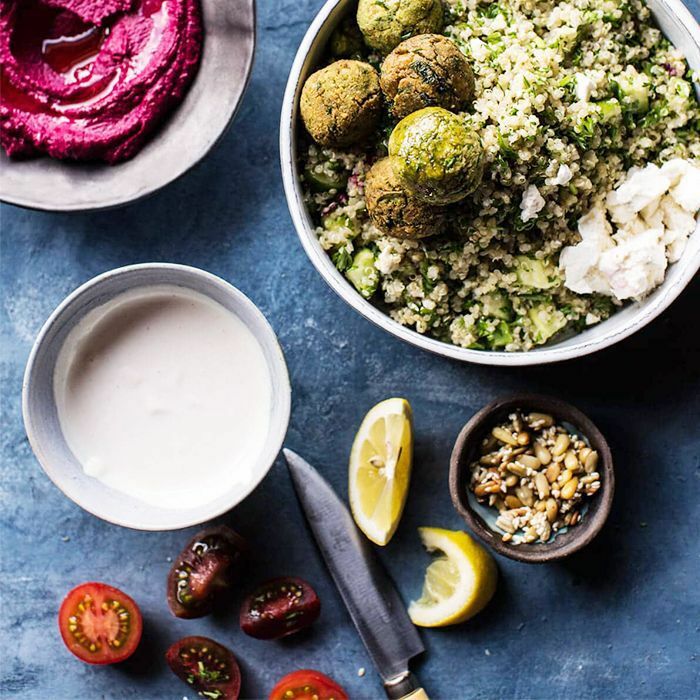 "The Mediterranean diet is often referred to as the gold standard of diets because of health outcomes associated with following this eating pattern," says Maya Feller, MS, RD, CDN, CLC, of Maya Feller Nutrition. Nutrition and cognition physician Gabrielle Lyon, DO, of Four Moons Spa encourages people to think of the Mediterranean diet more as a lifestyle than a diet. "It was initially based on the traditional diet of Crete," she explains. "It became popularized in the early 1960s when researchers looked at cardiovascular disease of the Crete population and their health status compared to that of the average American." Now, the Mediterranean diet is recommended as "a healthy way to eat for heart disease, high blood pressure, high cholesterol, and to promote general health," notes Sammi Haber, MS, RD, CDN, of Nutrition Works NY. Neda Varbanova of Healthy With Nedi, a certified culinary nutritionist, holistic health coach, and recipe creator, personally follows the Mediterranean diet. "I spend a lot of time in Greece and love how the Greek eat all-natural foods that haven't been processed—think of real food you can pick up with your hands and prepare, not something that comes out of a package," she describes. "You can find a farmers market—or a Laiki bazaar—in every neighborhood at least three days a week." The fresh local produce found in these markets becomes the foundation of any Mediterranean diet meal. As Feller explains, "It's an antioxidant-rich diet that is plant-based with heart-healthy fats rounded out with ample seafood." Feller explains that the Mediterranean diet is centered around "whole and minimally processed ingredients with a minimal amount of added sugars and red meats." It's in contrast to the typical Western diet that is heavy in refined grains, added sugars, saturated fats, and salt. Steven Gundry, MD, a heart surgeon and pioneer in nutrition, asserts that "the overriding idea to following a Mediterranean diet is the use of fresh produce, lots of olive oil, seafood, and the use of cereal grains and beans to deliver fresh herbs and olive oil." Varbanova advises that when selecting your olive oil, go for something darker. "The deeper the color, the better the quality," she reveals. Chef Silvia Barban, who was born and raised in Northern Italy, explains that the Mediterranean diet uses a food pyramid. "Desserts, red meat, and eggs are only eaten once weekly," she notes. "Alcohol is limited to one glass every day with your meal. This is the best part." To break it down a bit more, Haber summarizes the Mediterranean diet dos and don'ts as follows: "The main foods that are encouraged are vegetables, fruit, nuts, seeds, whole grains, seafood, and olive oil," she says. "Foods that are discouraged include added sugar, refined grains, processed meats, and sugar drinks. However, a glass or two of red wine is highly recommended." For additional beverages, Lyon notes that water, coffee, and tea are entirely acceptable as long as they are not sweetened. What makes the Mediterranean diet more of a lifestyle than a diet, she notes, is that research shows people who practice it have regular physical activity, communal meals in which they eat slower and enjoy the company of friends and family, and laugh. This is a major "do." Improves heart health: "The Mediterranean diet has anti-inflammatory as well as antioxidant properties and has been associated with a decreased incidence of cardiovascular disease as well as decreased risk of developing certain cancers," explains Feller. Haber continues that two important nutrients found in the Mediterranean diet—healthy fats and fiber—play a huge role in protecting our heart. Gundry cites the famous Lyon Diet Heart Study in which the Mediterranean diet was shown to be significantly more beneficial to one's health than the American Heart Association diet—so much so that the five-year study was stopped after three years as it was determined unethical to continue. Promotes healthy weight loss: Gundry also notes that "many people see their weight lower, their high blood pressure resolve, and their diabetes reverse" with the Mediterranean diet. The weight loss can be attributed to eliminating processed foods and sugar, notes Varbanova. Lowers bad cholesterol: "If someone has a history of cholesterol, they can expect to see their total cholesterol, LDL (or bad cholesterol), and triglycerides decrease from the diet," says Haber. "They might also see their HDL (or good cholesterol) increase." Increases energy levels: Even if you don't have any existing conditions, Haber explains that anyone following the diet will also notice improved energy levels and likely feel better overall. "Eating whole, healthy foods with fiber and healthy fats helps keep us feeling full and prevents large shifts in our energy levels," she says. "There's not enough variety." "From the U.S. perspective, it may be thought that the diet is hard to adhere to and doesn't provide sufficient variety," observes Feller. "For the American who does not consume fish on a regular basis, it may be hard to limit the red meat intake and increase the seafood." "It's carbohydrate-heavy." "People may think that they can have pasta at each meal, but the carbohydrates are based on vegetables," corrects Barban. Gundry goes on to say that "one of the biggest misconceptions of the Mediterranean diet is the health benefits of grains and beans." He explains that, in fact, the negative aspects the grains and brings bring to the diet are "counterbalanced by the overwhelming benefits of vegetables and fruits, olive oil, seafood, and wine." "Just a 'drizzle' of olive oil is enough." "A lot of people like to use the term 'drizzle a little olive oil like the Greeks or Italians,'" notes Varbanova. "This is a big misconception. No one in Greece 'drizzles' olive oil. They like to pour a good amount." "It's all you can eat." "Some people think that because this diet focuses on whole, plant-based foods, the amount eaten doesn't matter," observes Haber. "But because the diet is filled with healthy fats (and fat has more calories per gram than both protein and carbohydrates), it can actually become a fairly high-calorie diet." The key, as she notes those actually in Mediterranean regions do, is to eat slowly and truly enjoy the meal. "Those eating mindfully tend to savor each bite and, therefore, are able to honor their hunger and fullness cues better," she explains. "It's much easier to eat only until you're full to prevent overeating." "Wine is fine however you drink it." "While wine is a consistent part of the diet, wine is drunk with the meal, rather than as a drink for cocktail hour as done in America," says Gundry. "Wine, particularly red wine, is a rich source of the polyphenols resveratrol and quercetin, both powerful anti-aging compounds." "It is easy to transition to this diet," assures Gundry. "One of my first recommendations to my patients is to consider that the only purpose of food is to get olive oil into your mouth. I also urge people to bring a bottle of olive oil to the dinner table and pour it over most of the foods you are eating. Second, start adding more wild seafood and shellfish into your diet, replacing beef, pork, and chicken as the main animal proteins. Next, try to have a salad or other greens with at least two meals a day." Another easy change, recommended by Varbanova, is to let olive oil replace butter. "Buy good-quality olive oil," she insists. "Some grocery stores sell olive oil that has been so overly processed that the health benefits are no longer the same." Feller suggests starting by increasing your daily intake of non-starchy vegetables and increase your weekly intake of legumes while reducing your overall intake of red meat. "It can be done. However, it requires both attention and intention when planning and making food choices," she notes. When you're transitioning, Gundry notes that it's natural to experience more gas and bloating. This is actually a good sign, which he discusses in his book, The Plant Paradox, because it means that "you are feeding the good bugs in your gut that keep you slim and healthy." Next up, take a look at what "healthy eating" looks like in different countries.